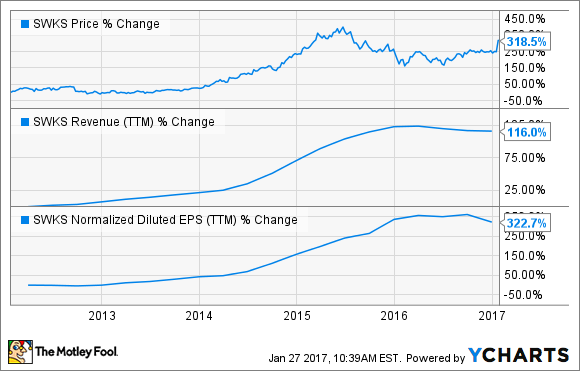 Which of these two tech companies is the better bet for new money today? Investing in the tech sector can be tricky. Competition tends to be fierce, which makes it difficult to stay one step ahead. Two companies that have a strong history of maintaining their edge are Skyworks Solutions (NASDAQ:SWKS) and Infinera (NASDAQ:INFN). Both of these businesses have been taking market share in their industries for years, which is impressive. But which of these two tech companies is the better investment today? Let's review the bull thesis for each company so we can make an informed decision. Skyworks designs and builds chips that allow devices to connect to each other. The company's semiconductors are found in a wide range of products such as routers, tablets, cars, and smartphones. While this industry is quite competitive, Skyworks' unique ability to create custom and complex solutions for its customers has given it a big edge over rivals. In fact, Skyworks chips can currently be found in nearly all of the top-selling smartphones in the world, including those made by Samsung, Xiaomi, and Apple (NASDAQ:AAPL). The massive boom in smartphone sales over the last few years has been a godsend for Skyworks. The company's revenue, margins, and profits have all soared, which has taken long-term investors on a lucrative ride. With the Internet of Things ramping up and 5G technology set to deploy, Skyworks looks well positioned to continue delivering for investors from here. However, Skyworks does have an Achilles heel that investors should be aware of. Apple is responsible for more than 40% of Skyworks' total revenue, which is a blessing and a curse. When iPhone sales are booming, Skyworks' results soar. However, when the Mac maker decides to reduce its channel inventory, Skyworks really feels the pain. While Skyworks has been signing deals in recent years to help reduce its customer concentration, Apple is such a huge component of Skyworks revenue that these two companies will remain attached at the hip -- for better or worse -- for the foreseeable future. Infinera is a fast growing player in the optical networking equipment market. The company's products make internet providers lives easier by allowing them to easily (and cheaply) move vast quantities of data around the globe. Like Skyworks, Infinera has also benefited from a number of tech trends. The rise of cloud computing and streaming high-def video is making it difficult for providers to keep up with demand. That's forcing them to invest huge sums of money to expand their networks, which has been a boon to Infinera's business. That's a wonderful backdrop, but Infinera has struggled over the last few quarters to translate that bandwidth demand growth into financial success. While there are several factors to blame, one of the biggest problems is competition. Ciena -- a much larger rival -- has caught up to Infinera's technological edge and has been eating the company's lunch as of late. While Infinera's management is aware of the problem and is investing heavily to recapture its edge, it might be a long-haul until the company returns to top-line growth. Of course, those worries have now been priced into the company's stock, so investors could be in a position to win big if the company can grow faster than market watchers expect. While I'm hopeful that Infinera can right its ship, there are never any guarantees of success. For that reason, I think that the better choice for investors today is Skyworks. Not only does Skyworks promise high growth rates ahead, but it is already so profitable that it pays out a fast-growing dividend and still has enough cash left over to buy back boatloads of stock. As long as the company can continue to make progress at fixing its customer concentration issues, then its future is looking quite bright.